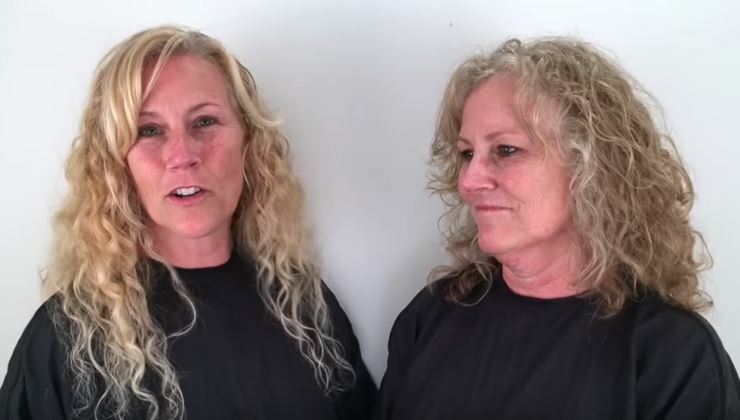 Joanie (on the right) flew in from California to meet her sister from Maryland for a sister makeover. They are pictured here in their before. We love this video. They each say what they like about each other’s before look, but what could be changed. Christopher and his team gave Joanie a “wheat blond” color, more original than the typical ‘blonde with highlights’ and she loved it. Christophyer explained. The makeup is kept neutral and reduces the ruddiness. I brought the hair up for lift and because she just wanted something different. She could go even shorter and more wedged or grow it back to the shoulders. But as long curly hair ages, it can just look weedy at front and sides. It’s often more youthful to remove bulk from the back to give more fullness to the front and sides. Wow what color and a great cut can do!